A boy. A secret. A summer. When I first read advance reviews and the synopsis of My Life Next Door by Huntley Fitzpatrick, I immediately requested the library order it. Sometimes contemporary young adult synopses make me roll my eyes, but this one sounded like a sweet story, perfect for summer reading. It definitely met my expectations, even if it didn’t wow me. I judge a lot by first lines, and this one hooked me right in: “The Garrets were forbidden from the start. But that’s not why they were important.” I love a story of forbidden love. But Jase Garrett isn’t exactly from the wrong side of the tracks in a traditional sense. He lives right next door. But Because Samantha’s mom is an uptight, judgmental Republican, she’s not supposed to associate with them. In this small seaside Connecticut town, having a large family is enough to make people talk. The love story was very sweet. The back cover has a line from Simone Elkeles, author of the Perfect Chemistry series: “Jase and Samantha have a heart-warming romance every girl will envy” and I certainly agree. The high school sweethearts are almost too perfect—but certainly sweet. I found myself hoping to see more of Tim, Samantha’s best friend’s bad boy brother. He was certainly the most well-drawn character of the book. I sympathized with his addiction, laughed at his wise cracks, cheered him on as he grew and changed. He was the only character I felt went through a drastic change during the course of the novel. George, Jase’s four-year-old brother, was outstanding and stole the show every time he turned up on the page. All of his sensitive science-nerd antics had my heart melting. I wasn’t clear what point Samantha’s sister served—she’s a big part in the beginning of the book, and disappears. Nan, Sam’s best friend, turned out to be a terrible friend, and I didn’t feel like that storyline had any resolution, and was therefore meaningless. The plot was slow to develop. Without giving too much away, I’ll say I didn’t quite believe that Mr. Garrett would be walking by himself on a road in the rain, but it only slightly distracted from the overall story. 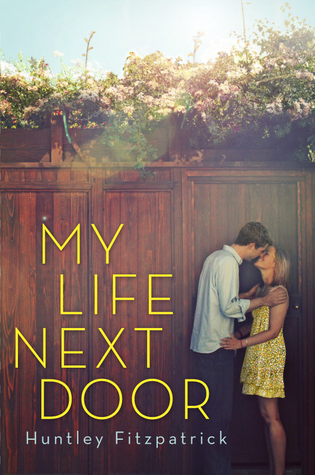 I found My Life Next Door a satisfactory read, and won’t hesitate to recommend it to young readers who enjoy contemporary romance that isn’t too heavy, but it won’t be making it on my top ten books of the year list. If Huntley Fitzpatrick publishes another novel, I’d check it out, if only to see how she grows as a writer.